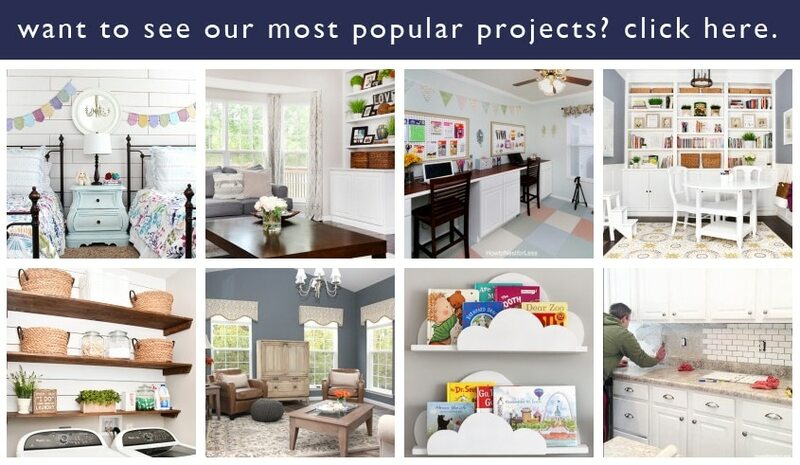 It’s 99% of parents favorite time of year– back to school! 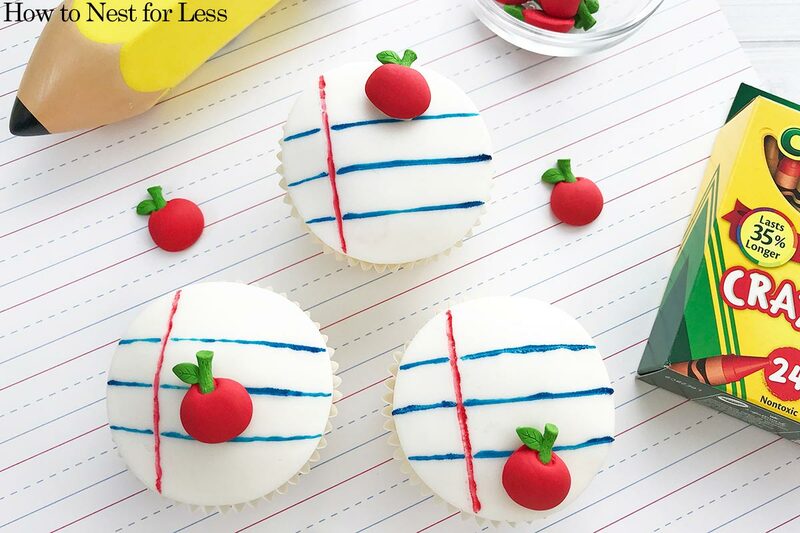 And what better way to celebrate than with back to school cupcakes? 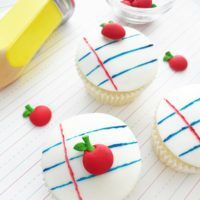 These back to school cupcakes are easy to make and are the perfect “Thanks for teaching my kid!” teacher gift– because it’s always best to start off the school year on a high note, and what teacher doesn’t like homemade cupcakes? 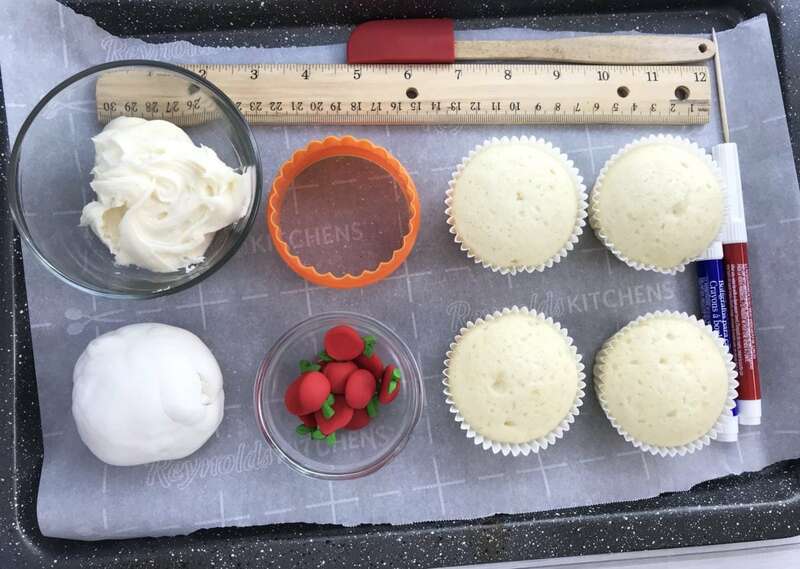 Once your cupcakes have been baked (see recipe below), allow them to cool and gather up all of your supplies. 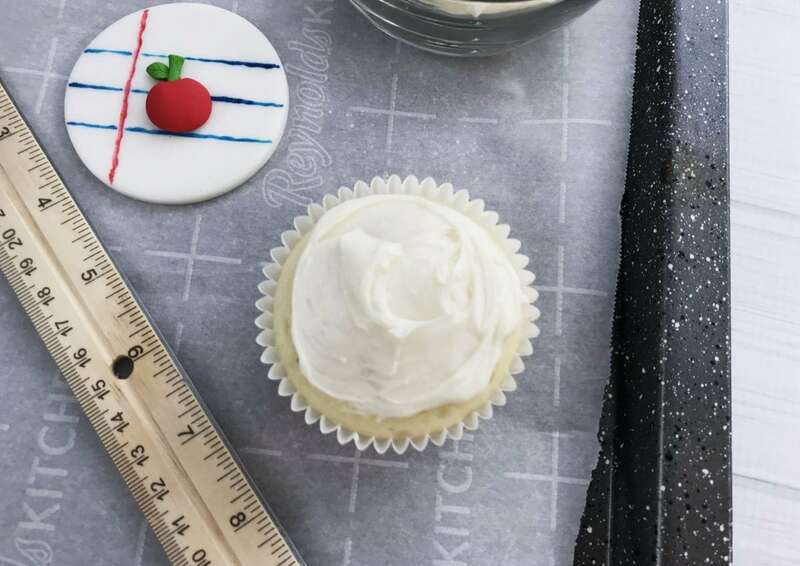 Once the fondant is rolled to about 1/4″ thick, use the 2.75″ round cookie cutter to cut the fondant – repeat this process for 24 cupcakes. 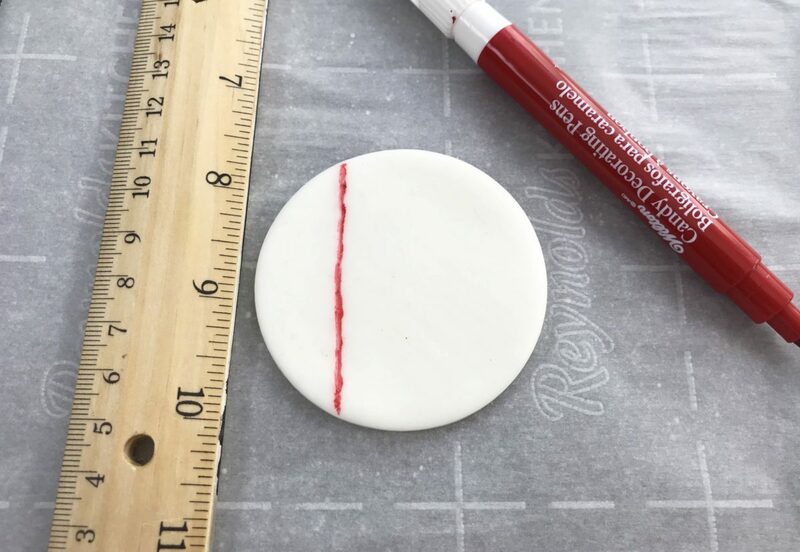 Once you have all the fondant toppers ready, use the ruler and a red edible marker to make the first red line down the side of the fondant. 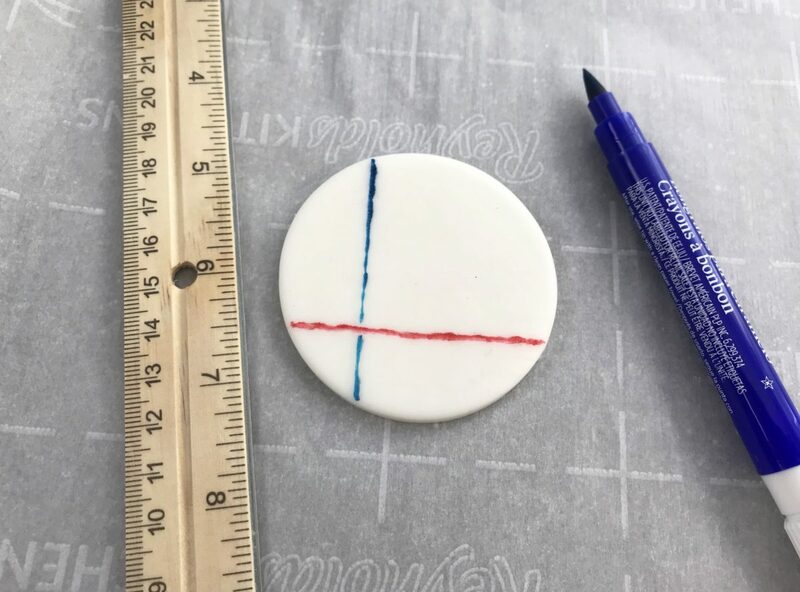 Use the blue edible marker to make three paper lines across the fondant in the opposite direction so it looks like paper. Repeat this process with all the fondant toppers. Generously frost each cupcake and place the fondant on top of each cupcake. 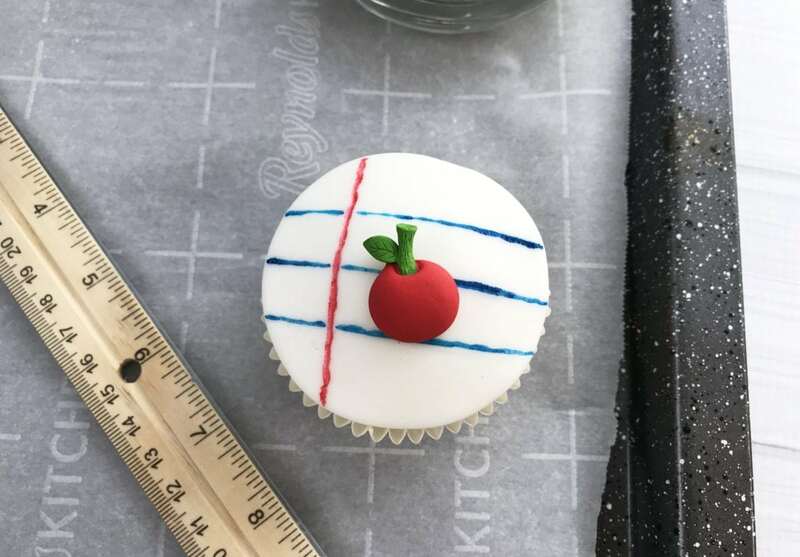 Place a small amount of frosting on the back of the apple icing and place on top of the fondant. Repeat with all cupcakes. 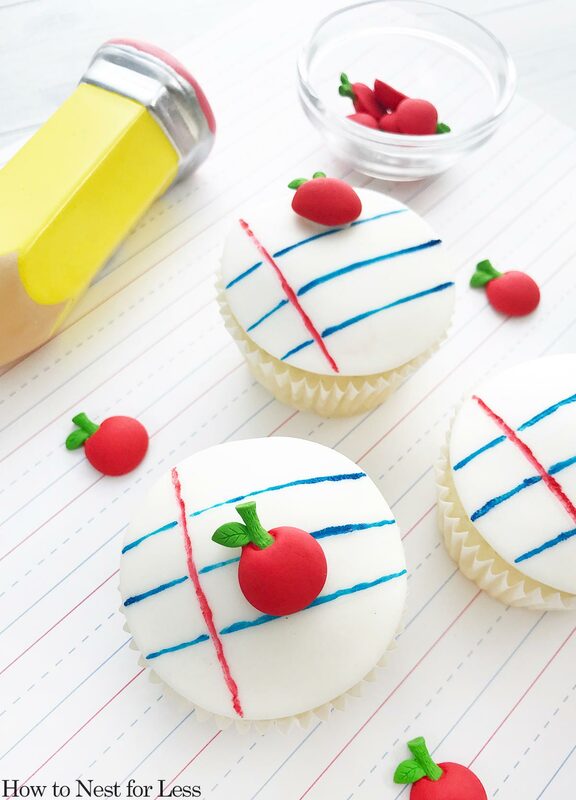 Hello, adorable notebook-themed back to school cupcakes! Package up your completed back to school cupcakes in one of these handy boxes, add a bow, and you’re good to go! Combine the cake mix, eggs, oil and water. Fill the each muffin well about 2/3 full. 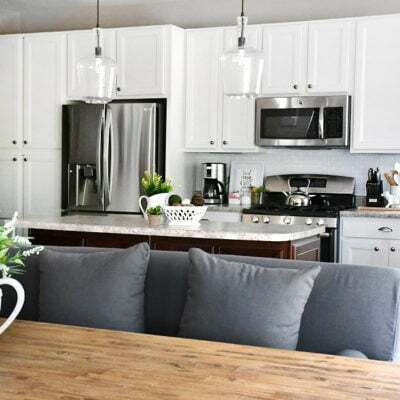 Insert a toothpick around 18 minutes and it comes out clean, the cupcakes are done. 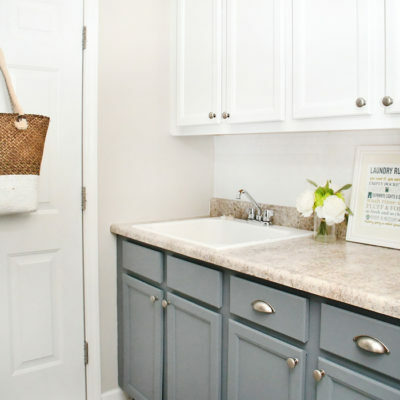 Remove from the oven and let cool prior to decorating. 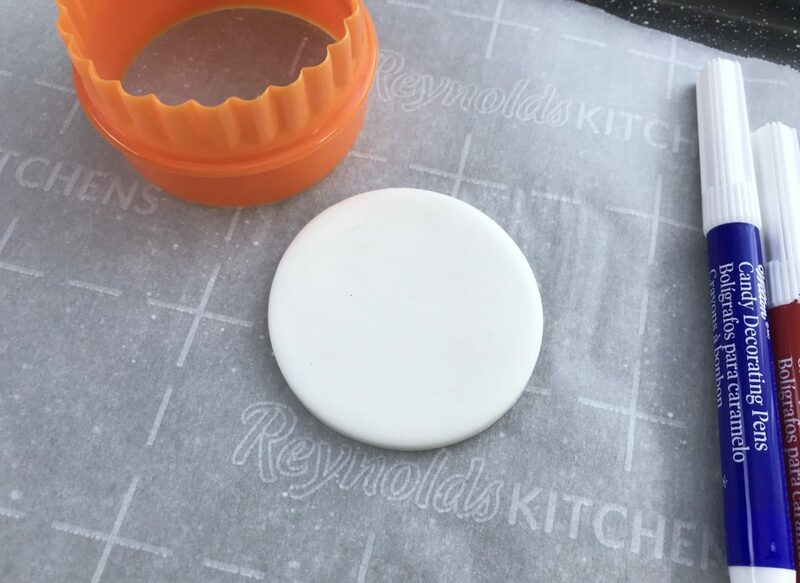 Once the fondant is rolled to about 1/4" thick, use the 2.75" round cookie cutter to cut the fondant - repeat this process for 24 cupcakes. 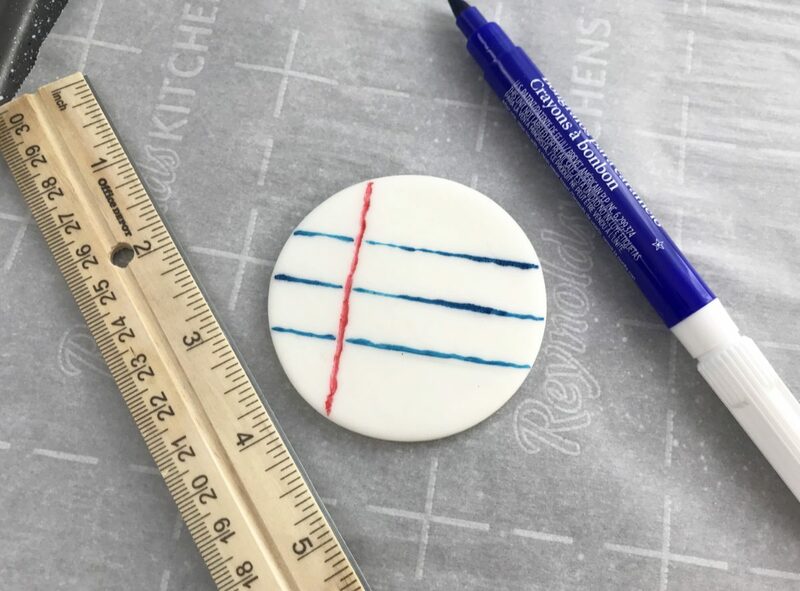 Next, use the blue edible marker to make three paper lines across the fondant in the opposite direction so it looks like paper. Repeat this process with all the fondant toppers. Place a small amount of frosting on the back of the apple icing and place on top of the fondant. 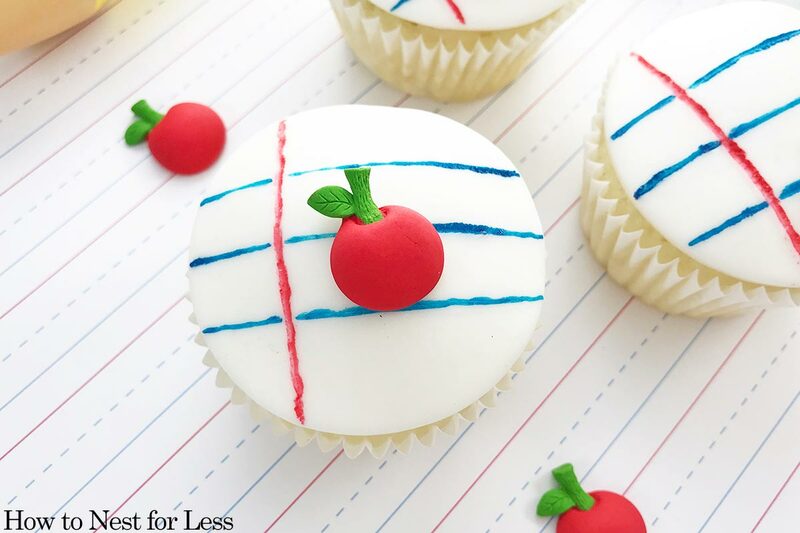 Think your kid’s teacher isn’t much of a cupcake lover? 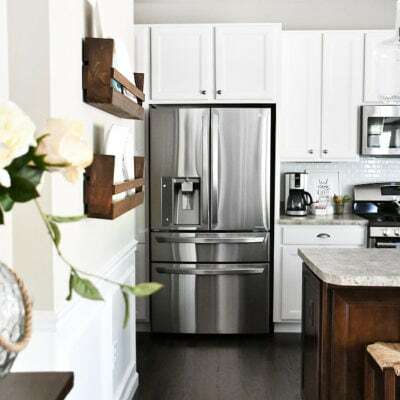 Whip up some gooey butter cookies, cake pops, or triple layer bars! 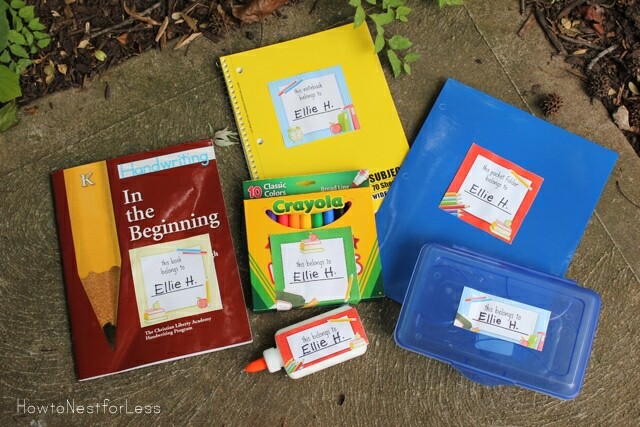 Don’t forget to check out our FREE back to school printables– chore chart and labels!